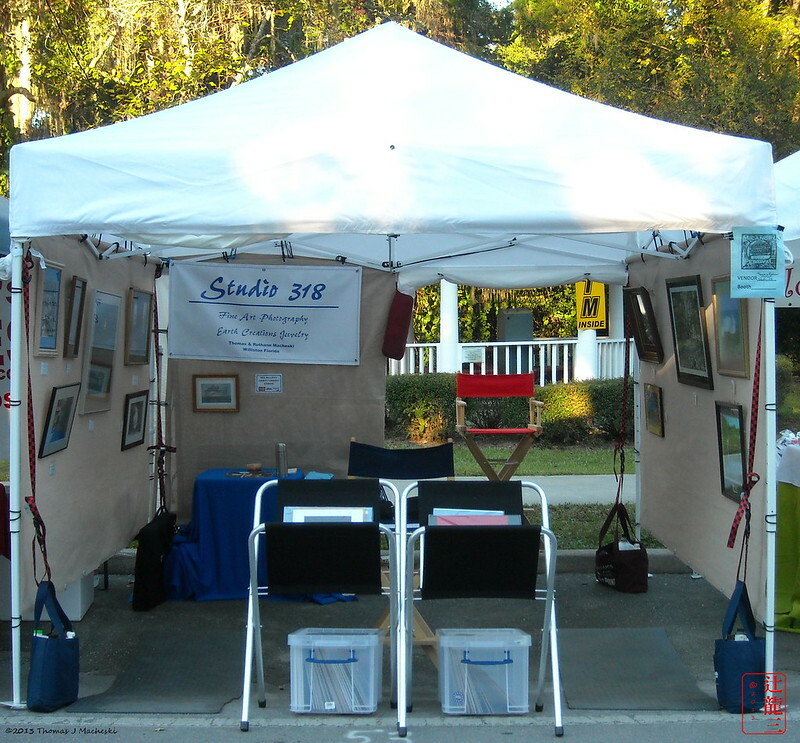 Quick Summary: Micanopy Harvest Art Festival - Ramblings of Mad Shutterbug & the Border Collie Bros. I did attend this event some time in the past, though I don't remember exactly when. Long enough ago that the Eagles were a featured entertainment group, being relatively local back then. Over 25 years ago, though, on that I'm rather sure. I recall it being big then, and it's not gotten smaller. Don't know any attendance numbers, can tell you the crowd started early (before 'Opening Time' both days) if small, and then gradually escalated in size. There would be gaps in the crowd, and other times so full that it made it difficult to see the opposite side of the road. The occasional gap in the crowd happened, often when the live entertainment happened on either or both the two stages set up. Our booth was quite near one of those two stages, situated such that the speakers pointed away from our booth. So I could hear the entertainment and not be overpowered by the sound. If I sat in the chair I kept just out the back side of the booth (the Red Chair, nominally Herself's Chair) I could also watch some of it. All of it proved good, some quite good. Saturday morning seems like the largest number of people who actually came in to look at photos on that day, with the sales in late morning shortly before noon. Sunday somewhat the opposite, the early morning crowd wasn't interested in photography and the single sale for Sunday in the afternoon. Business wise, we made half our booth fee, so financially not a total wash and yet a bit of a write-off. Still, I'll apply for this festival again next year. The folks in Micanopy come together as a community to pull this off, and it is a community fund-raiser to help out a number of local non-profit concerns. This includes a local animal hospital (large and small vet), several youth organisations (yes, some affiliated with community churches, and I still support that even if not my belief structure), and more. It's obvious from the get-go they plan on the huge crowd. Vendors are brought in by a certain route for check-in and setup, the traffic flow is designated as one-way for vehicles during the days of setup and festival. Vendors are told, pull up to your space, unload, then go park before setup. This is enforced; vendors who do not comply are not invited back. Vehicles are not allowed on the street by an hour before show time, and vendor parking is provided (and fairly secure) within easy walking distance of ones booths. They colour-code the areas for setup and for parking. So there isn't a lot of reason not to comply. Cut just because, it's not a huge image. I do a booth photo on all of these types of events for several reasons. Documenting each setup to compare with recollection or notes on crowd/flow, because many of these festivals that are juried want a photo of the booth setup to show a professional appearance, and just for myself. Overall I liked this setup. You can see if you look close there is a steep bit of slope at the front of the booth; we were set up in the parking lane for this part of the road and it also serves for rain run-off drainage. Booth neighbors on either side used tables, and brought blocks with them to help level those tables. I thought about it, and likely will add such to the Physical Plant tote crate for future. This is the first time I've dealt with this much slope, nearly all the sites for anything else proved fairly level or not so much sloped to need major adjustment. I am also planning to make signage to include in the 'Office Box', one for each side, with notices to 'Watch Your Step: Uneven Ground' for future use, because if it happens once, it will happen again. Same reason I'm thinking about adding some blocks that I've got (they live in Studio as that's where I tend to use them). So, yes. Enjoyed myself. Willing to repeat at least once. This entry was originally posted at http://madshutterbug.dreamwidth.org/673469.html. Please comment there using OpenID. Glad it went (relatively) well! I cannot wait till I have money for Art again.